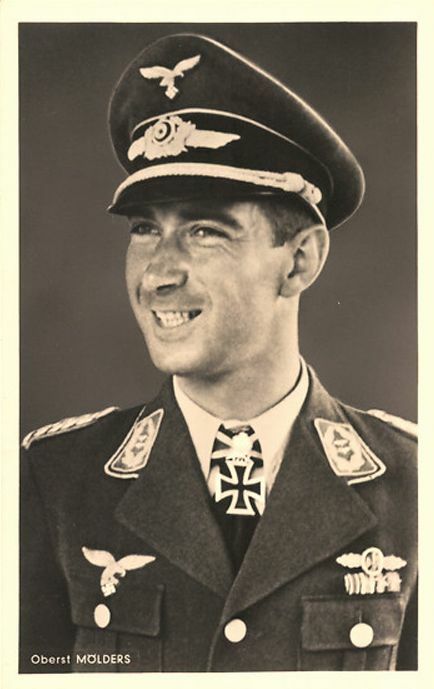 Wilhelm-Ferdinand "Wutz" Galland (23 October 1914 – 17 August 1943) of JG 26. Wutz was killed in action during the Schweinfurt-Regensburg mission. It was a tremendous loss for the Luftwaffe, as he was one of the most well-known of the pilots in the West. When he was in the air, his mates would cry "Wutz! Wutz!" over the radio whenever he scored a victory. The Allies thought this was some kind of code. There were many Luftwaffe Aces who became celebrities during the war. Invariably, the famous pilots were fighter jockeys, though a Stuka pilot such as Hans Erich Rudel or test pilot such as Hanna Reitsch snuck in here and there as well. Luftwaffe pilots ran up astonishing kill totals for various reasons, including the fact that they did not have defined 2-year tours of duty like American and British pilots. They fought until they died, were captured, got a cushy staff position, were invalided home, or the war ended. Also - not that they would necessarily say this was a great thing all the time - they simply had more targets of opportunity as the war wore on. Allied planes were everywhere by 1945. Basically, they fought until they were shot out of the skies. Some also found great opportunities in the night fighter force, as the nightly Allied bomber streams became a top priority of the Luftwaffe high command. 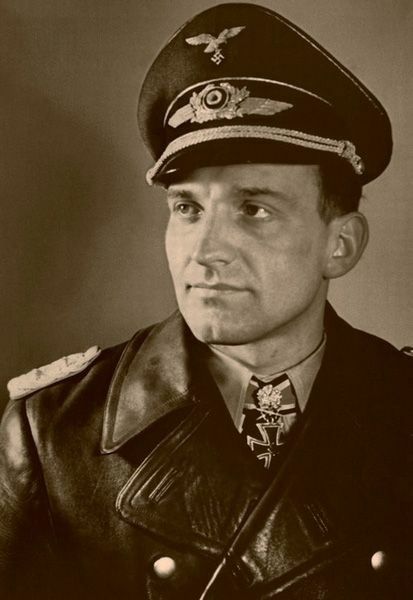 Heinz-Wolfgang Schnaufer (16 February 1922 – 15 July 1950) was a German Luftwaffe night fighter pilot and is the highest scoring night fighter ace in the history of aerial warfare. All of his 121 victories were claimed during World War II at night, mostly against British four-engine bombers, which were considered the ultimate targets. 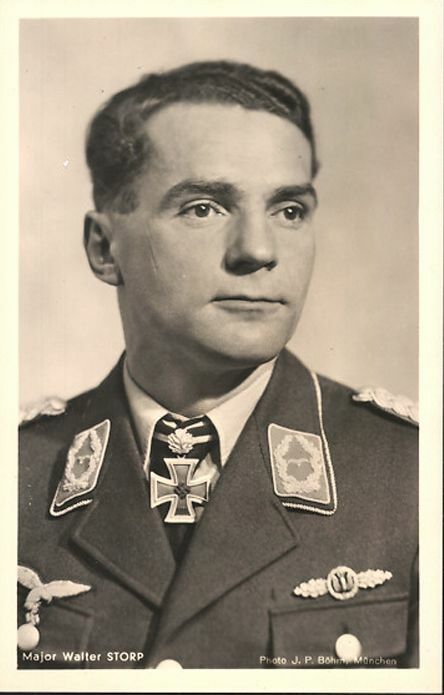 He was awarded the Knight's Cross of the Iron Cross with Oak Leaves, Swords and Diamonds on 16 October 1944, Germany's highest military decoration at the time. He was nicknamed "The Spook of St. Trond" and truly was one of the most valuable men in the Luftwaffe. Whereas an Allied fighter pilot became famous with 20 victories, Luftwaffe pilots routinely racked up scores in the triple figures. 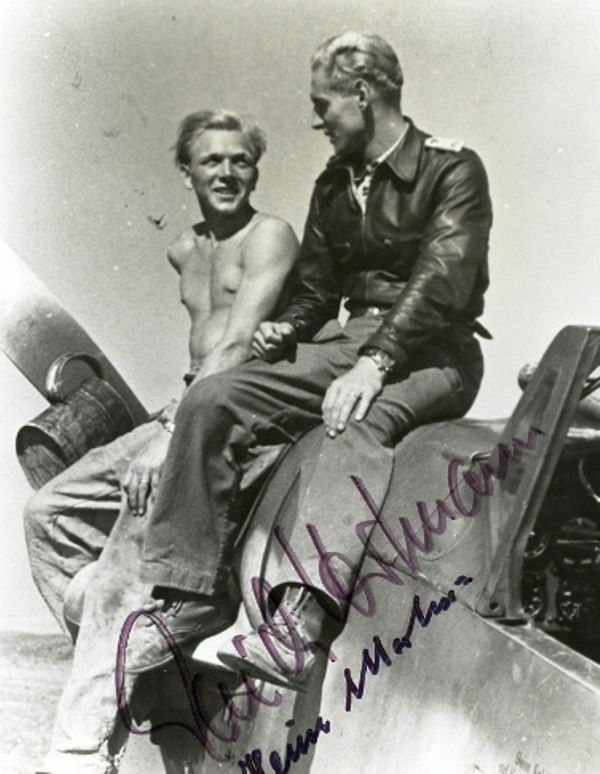 For comparison, the top American Ace was Richard Bong (40) who achieved his score in the Pacific, and the top Soviet Ace was Ivan Kozhedub (64). Luftwaffe aces in the Bundeswehr. 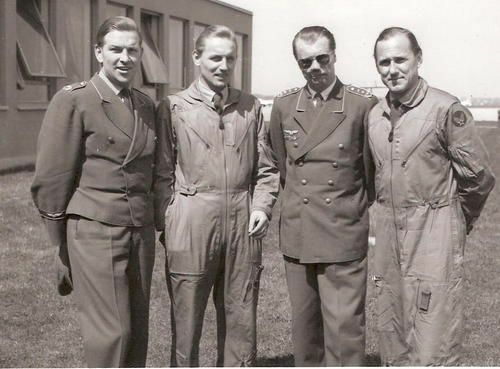 Photo from the 1960's: Walter "Graf Pinski" Krupinski (1920-2000; 197 aerial victories), Erich "Bubi" Hartmann (1922-1993; 352), Johannes "Mäcky" Steinhoff (1913-1994; 176) and Günther Rall (1918-2009; 275). 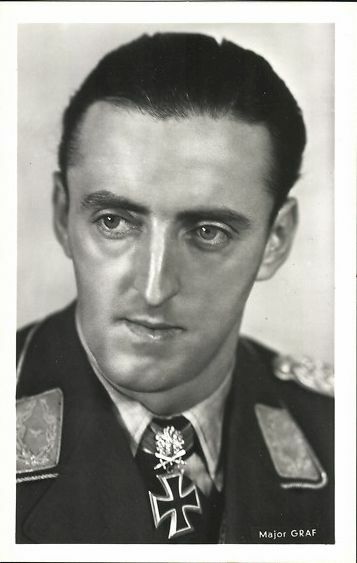 A few pilots were moved to office jobs after they reached milestone victories such as 100 kills (Pips Priller of JG 26, for instance), as the propagandists did not want to have to explain their deaths to a war-weary public. 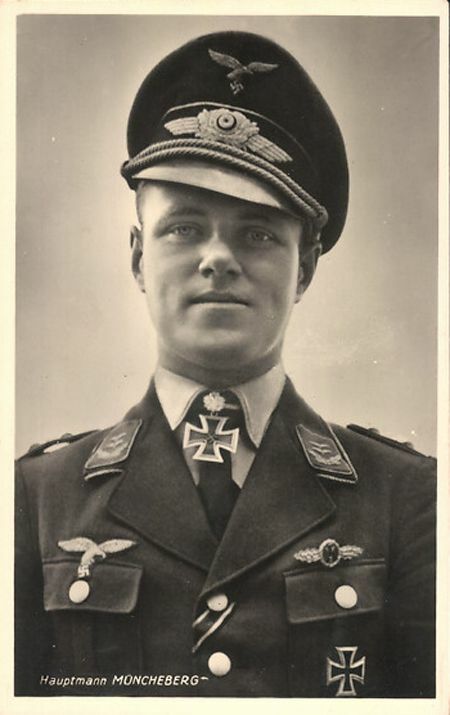 The top "Spitfire killer " Oberst Josef "Pips" Priller. Pips was the most successful Luftwaffe pilot in battles with Spitfires, claiming at least 68 of them. 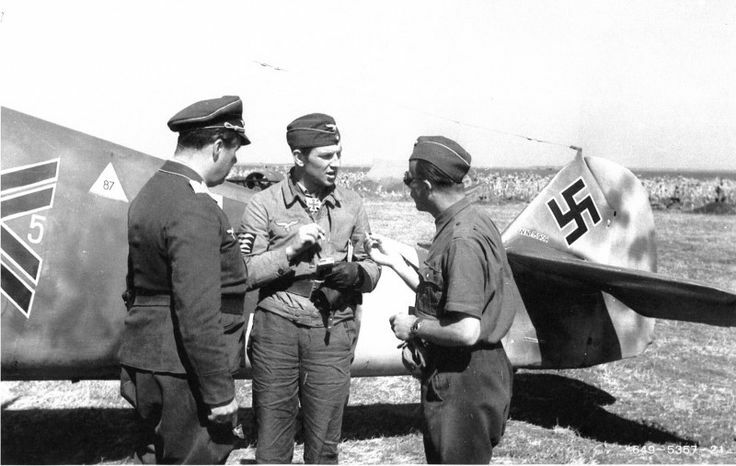 Josef “Pips” Priller flew 1,307 combat missions to achieve 101 victories. All his victories were recorded over the Western Front and include 11 four-engine bombers. The spectacular aerial invasion beach footage from "The Longest Day" was a fictional shot from his aircraft during a real-life heroic pass over the beaches on the morning of 6 June 1944 - the only Luftwaffe appearance over the invasion beaches that day. Quite a few aces, however, served throughout the conflict, invariably cheating death time and again. This kept front-line Luftwaffe quality relatively high during the middle years of the conflict, but hurt training as the top pilots were not sent to the rear as trainers as many of the Allied aces routinely were. Another photo of Pips, this time with his 2 BMW powered machines. 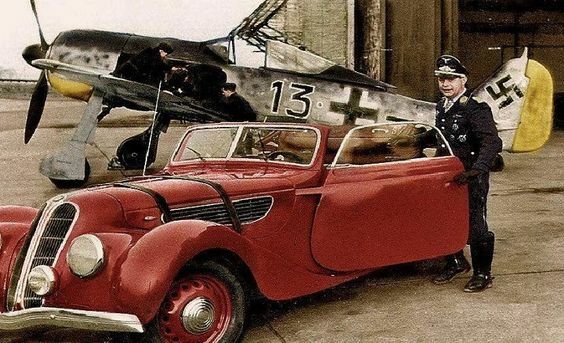 A Focke Wulf 190 and a BMW 327/55 (colorized). Luftwaffe pilot quality declined drastically in the final year of the conflict. Score counts were tightly regulated, with everything verified or it just didn't count. Thus, many Luftwaffe pilots claimed - probably all the experten, in fact - that they actually shot down more planes than the official totals. In addition, scores on the Western ("Kanal") front were respected much, much more highly than those achieved on the Eastern Front due to the higher caliber of opposition. 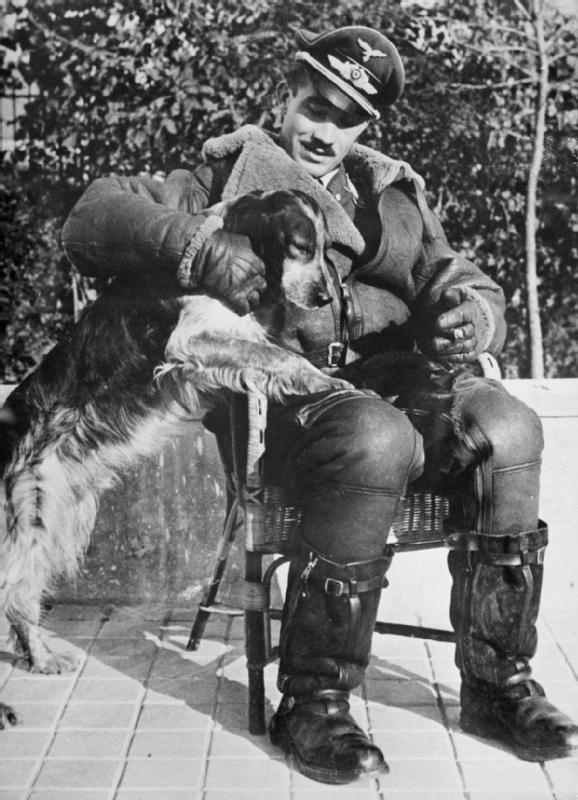 Adolf Galland, who was highly respected but also considered a bit of a dandy by his fellow pilots. Here, he is wearing an Irvin jacket. He got his 104 victories the hard way, on the Western Front, the last few in a Me 262 jet. He was one of the first jet aces. Adolf Galland rightly gets a great deal of press as a top World War II fighter pilot with 104 victories. He later became the Inspector of Fighter Pilots and flew jets at the very end (becoming an Ace in the Me 262 with seven victories). 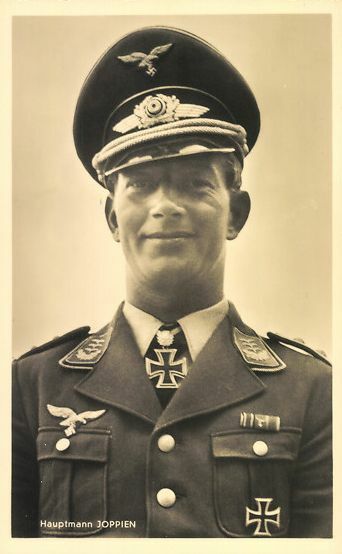 Less well-remembered is his brother Wutz, who took over for him at JG 26 and led that elite formation in Channel battles until his death during the summer of 1943. 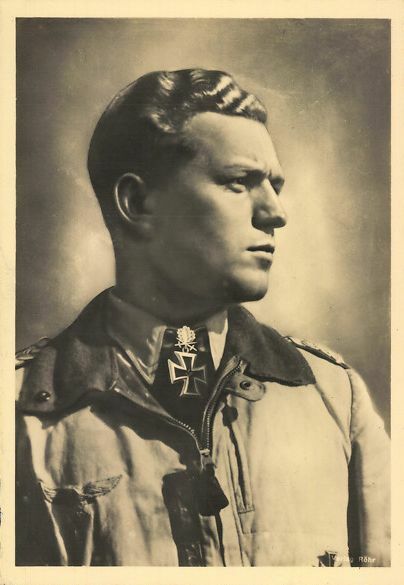 Hans Ulrich Rudel, ace Stuka dive-bomber during the Second World War. While not technically an ace, he was a legend with his attacks on Soviet tanks. Erich "Bubi" Hartmann is the top ace of all time with 352 credited kills (and likely many more that were not verified). 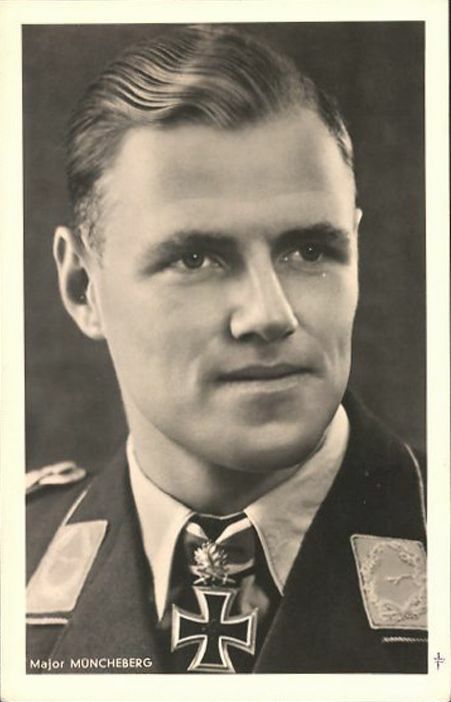 Gerhard Barkhorn got 301 victories, an astonishing total, but nobody remembers him because he came in second and got all his victories against the Soviets. Günther Rall (275), Otto Kittel (267) and Walter Nowotny (258) round out the top five. 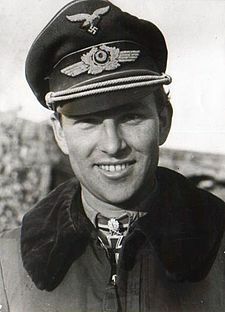 Gerhard "Gerd" Barkhorn was the second most successful fighter ace of all time after fellow Luftwaffe pilot Erich Hartmann. 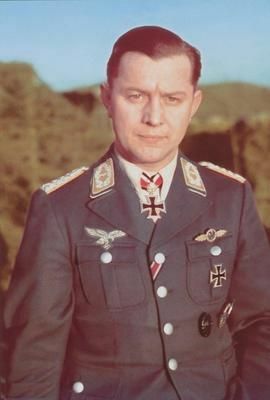 Gerhard Barkhorn was credited with 301 victories gained in 1104 missions. All his victories were recorded while flying over the Eastern Front. I also want to recognize top aces that didn't last long enough to get on the lists of the top scorers of the war. Many were fabulous pilots, but things didn't work out for them, and it wasn't always (or usually) their fault. They might have been killed, or captured, or wounded too badly to continue flying. Some top pilots were shot down by friendly fire and wound up captured - that sort of thing happens in war (Adolf Galland himself came close to being shot down by a fellow Luftwaffe pilot). I can't list all of them, so Hans-Karl Mayer will stand in for them. Gruppenkommandeur of I./JG 53, Mayer had 39 claims at a time when the leader in the Luftwaffe, Werner Mölders, only had 47. Clearly, Mayer had huge potential. However, he disappeared during a test flight on 17 October 1940. His body washed up on a beach ten days later, and nobody knows what happened. That is how quickly it could end for any of the pilots on this page. This page is not comprehensive, and is not in any order. It is simply a look at a cross-section of Luftwaffe aces. 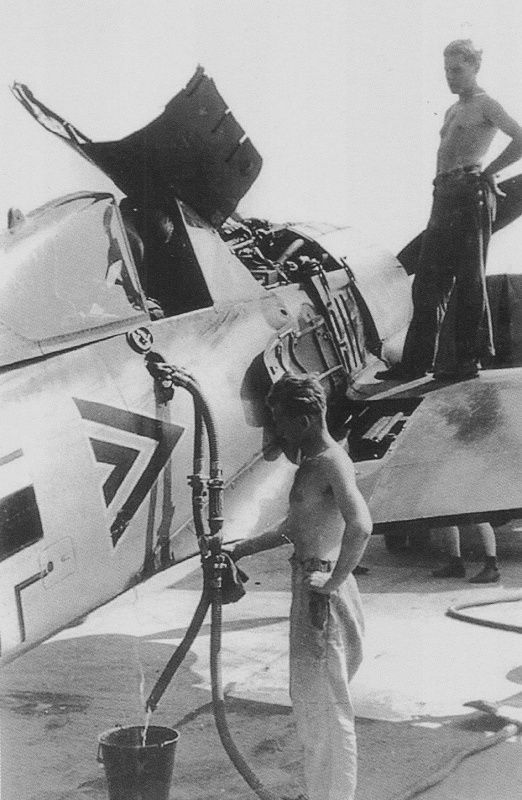 Bf 109 G-6 of Hptm Gerhard Michalski, Gruppenkommandeur II./JG 53, Comiso, Italy, 1943. Note the unit insignia above and between the men. 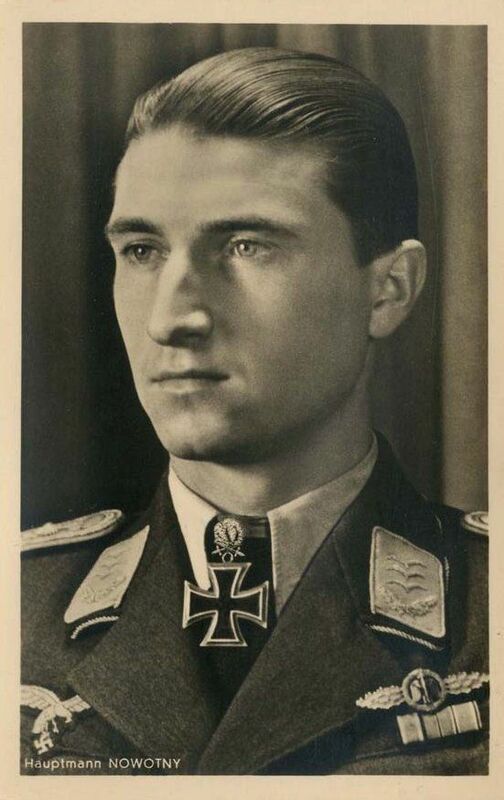 Because of his youthful appearance, Luftwaffe Major Erich Alfred Hartmann was nicknamed "Bubi" ("kid"). With over 350 confirmed aerial victories, he is undoubtedly the greatest fighter pilot in human history. He was awarded the Knight's Cross with Oak Leaves, Swords and Diamonds, Germany's highest military decoration at the time. With Germany's defeat, he was charged with various war crimes and spent over ten years in Soviet POW camps. The Soviets particularly detested him and, during the war, gave him the nickname "The Black Devil." He was released in 1955, one of the last Heimkehrer. 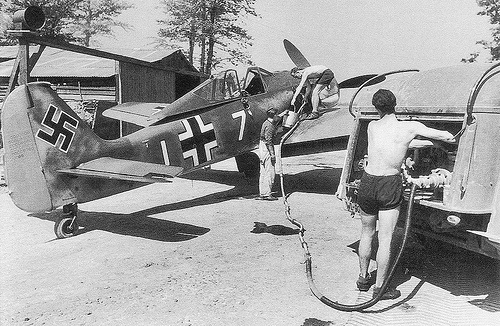 This is the German fighter Focke-Wulf Fw 190A3 of Lieutenant Egon Mayer of 7.JG2 while refueling at Theville. The Kiel fighter shows a visible mark of 44-x aerial victories. 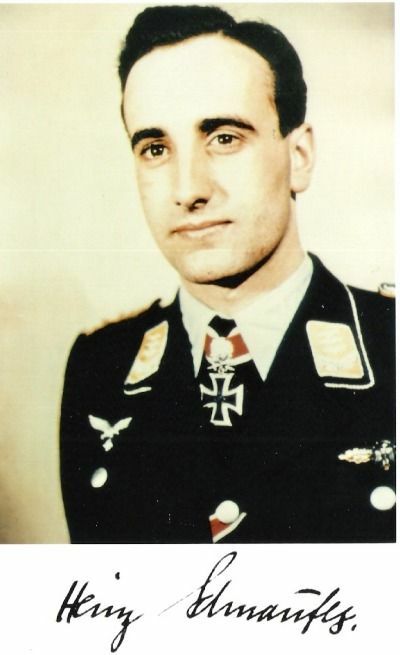 The overall score by Egon Mayer (served June 13, 1940 until KIA March 2, 1944) was 102 aerial victories. Major Erich Rudorffer (1 November 1917 – 8 April 2016) had 222 kills, including 12 kills with the Me 262. Rudorffer once claimed 13 kills in 17 minutes. No other pilot in history has as many multiple air to air victories as Rudorffer. Born in 1917, he is alive today as of this writing at 98 years old (he since has passed). Rudorffer is one of the handful of pilots who served in the Luftwaffe for the duration of WW2 - they did not get to go home after 20 missions, like Allied bomber crews, or after a year or two, like US fighter pilots. 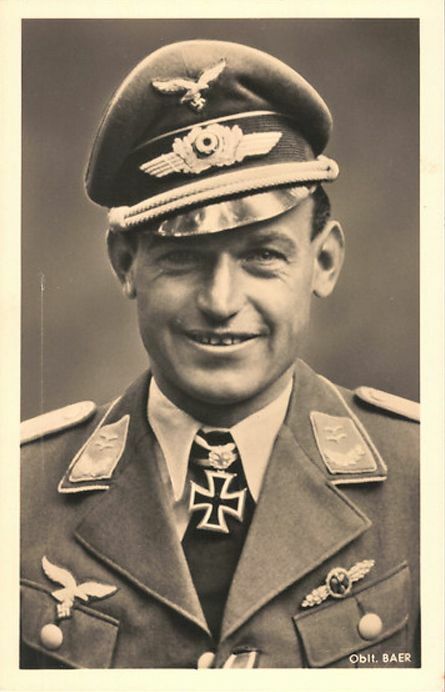 Rudorffer is the 7th most successful fighter pilot in history, fighting in all the major German theaters of war, including the Battle of Britain, European and Mediterranean Theater of Operations and the Eastern Front. (Stacheischeind, National Archive, colorized). 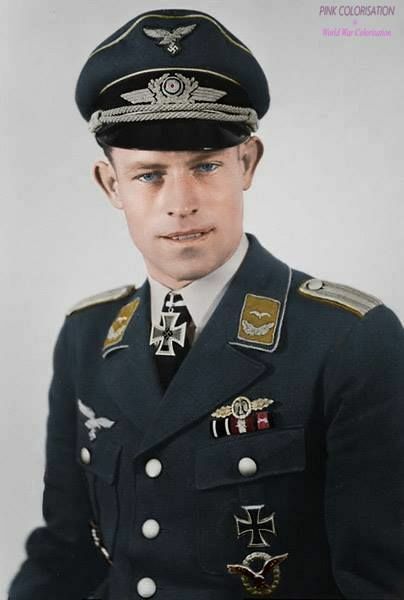 Heinrich Ehrler (14 September 1917 – 4 April 1945) was a German Luftwaffe military aviator during World War II, a fighter ace credited with 208 enemy aircraft shot down in over 400 combat missions. which included eight in the Messerschmitt Me 262 jet fighter. Heinrich Bär flew more than one thousand combat missions, and fought in all major German theaters of the war, including the Western, Eastern and Mediterranean fronts. On 18 occasions he survived being shot down, and he was credited with 221 aerial victories, 16 of which were in a Me-262 jet fighter. Werner "Vati" Mölders became the first pilot in aviation history to claim 100 aerial victories. He became Inspector of fighter forces, and his death in November 1941 was considered a national tragedy. He was succeeded by Adoph Galland. He is responsible for the classic finger four formation that was adopted by all air forces and remains in use today. Werner Mölders' legacy, the finger four formation. 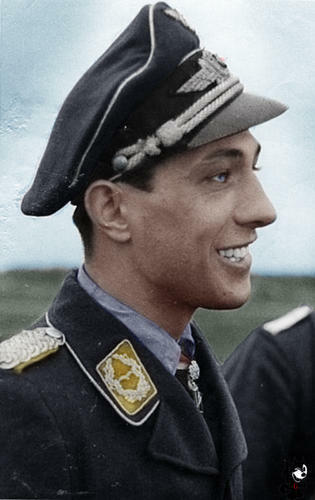 Colorized photo of night fighter ace Major Martin Drewes. 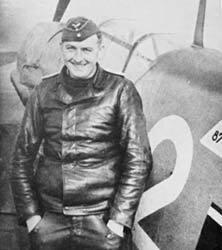 Joachim Müncheberg is credited with 135 enemy aircraft shot down claimed in over 500 combat missions. The majority of his victories were claimed over the Western front with 33 claims over the Eastern Front. Included in his 102 aerial victories achieved over the Western Allies are 46 Supermarine Spitfire fighters. Müncheberg was KIA in his Bf 109 G-2 on 23 March 1943 over Tunisia when his final kill, a Spitfire, exploded too close after a burst of cannon fire. Hermann-Friedrich "Jupp" Joppien. On 28 August 1941, Joppien entered combat with Russian fighters and bombers near Jelnja. 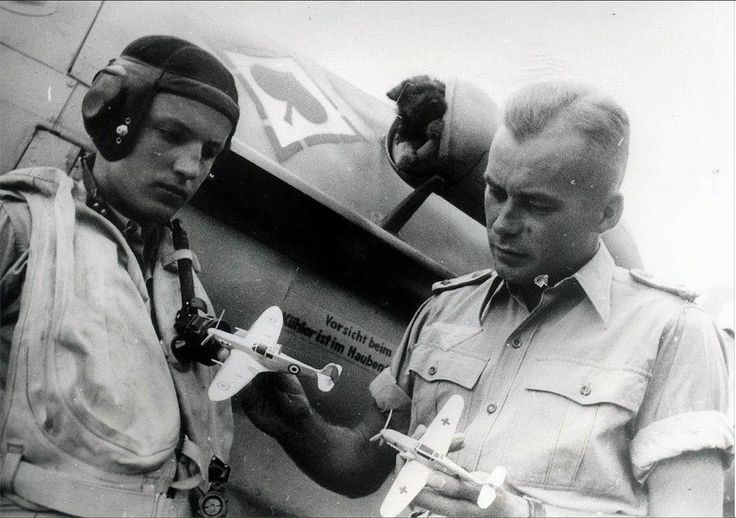 In the action Joppien was shot down and killed in his Bf 109 F-2 by a Russian MiG-3 fighter. Joppien was credited with 70 victories. His victory total included 42 victories recorded over the Western front. Included in his total are 23 Spitfires. 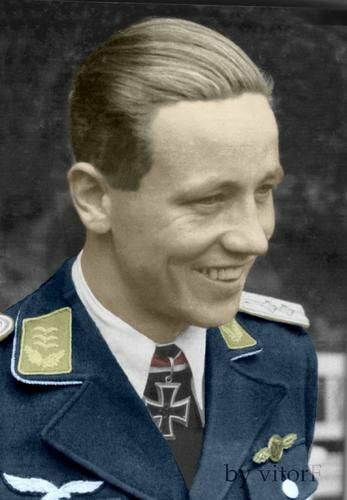 Johannes "Hannes" Trautloft was a fighter ace who served in the Luftwaffe from 1932 until the end of the war and again from 1957-1970. He flew 560 combat sorties and was credited with 58 victories. He was regarded as a very competent leader, and much respected from those serving beneath him. He also was known as the father of JG 54 (the "Green Hearts"), which along with JG 26 was the dominant fighter squadron on the Western Front before transferring East to help with Barbarossa. 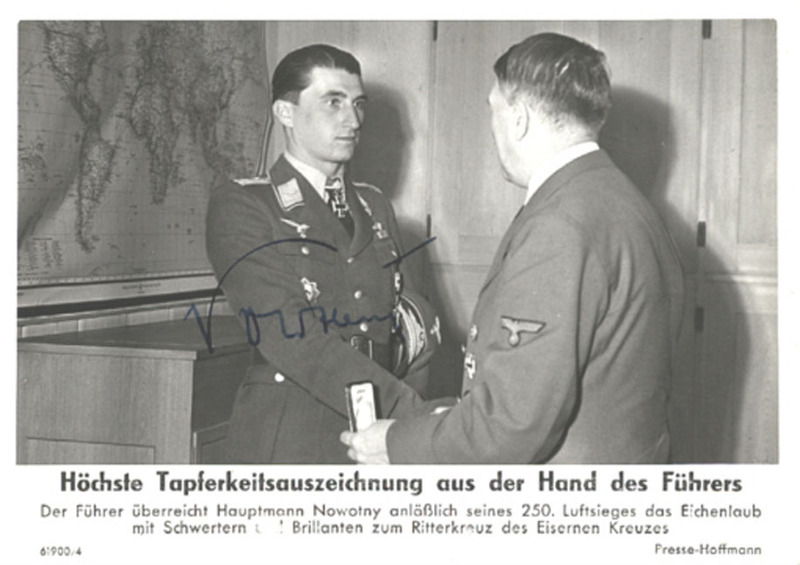 Walter Nowotny receives his oak leaves, swords & diamonds. Walter "Nowi" Nowotny flew over 442 missions in achieving 258 victories. His average of one victory for less than two missions is one of the highest, if not the highest, in history for a top ace. Nowotny recorded 255 of his victories over the Eastern front, which was an easier place to get victories, but that still is quite a record. Nowotny claimed 24 victories over the heavily armoured Il-2. Of his three victories recorded over the Western front, 2 were four-engine bombers and all 3 victories were gained while flying the Me 262 jet fighter. The first Me 262 squadron was known as "Squadron Nowotny" at first because he developed it. Nowotny crashed in his Me 262 during a mission on 8 November 1944, and nobody could tell if he developed engine trouble or was shot down. 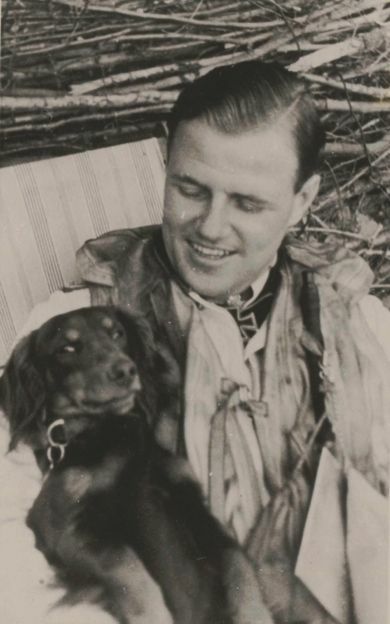 Hans “Assi” Hahn was credited with 108 victories in 560 missions. He recorded 66 victories over the Western Front, of them 53 were Spitfires. Of the 42 victories he recorded over the Eastern front, at least seven were Il-2 Sturmovik ground-attack aircraft. Walter "Gulle" Oesau (28 June 1913 – 11 May 1944) was a German World War II fighter ace served on all fronts. Oesau was aged 30 at the time of his death. He had a total of 127 kills gained over 300 missions: 27 were Spitfires, 14 four-engined bombers, 44 were scored on the Eastern front and 9 in the Spanish Civil War. In recognition of his amazing record, JG 1 received the title Oesau in honor of its fallen Geschwaderkommodore. Bomber pilots don't get any recognition at all, but they were just as essential to the troops as fighters. Many battles that were close-run affairs were won only because of bombing that served as a form of mobile artillery - a key part of the so-called "Blitzkrieg." 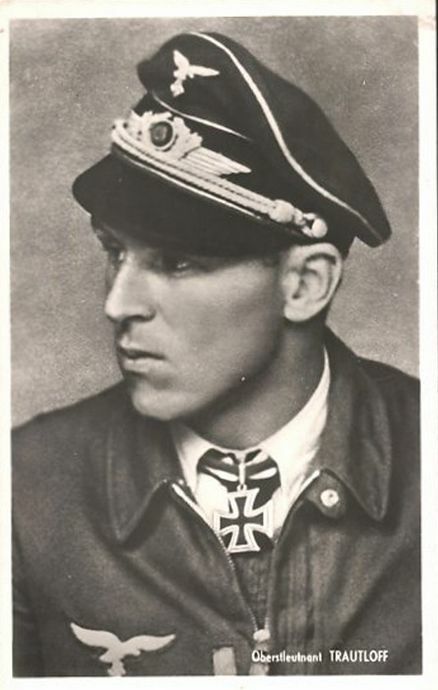 Walter Storp was a German World War II Luftwaffe bomber pilot and commander of various bomber wings. 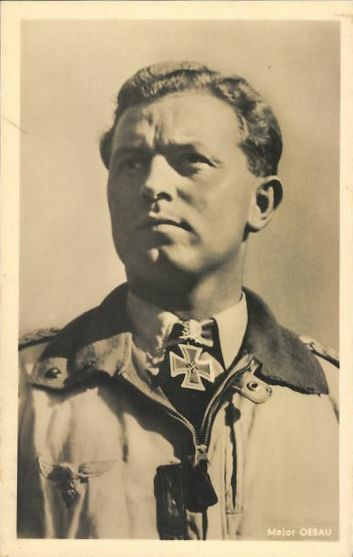 Walter Storp was the twenty-second recipient of the Knight's Cross of the Iron Cross with Oak Leaves on 14 July 1941. Commands he held included KG 6, SKG 210, and KG 76. While not an ace himself, Josef Kammhuber deserves a mention. 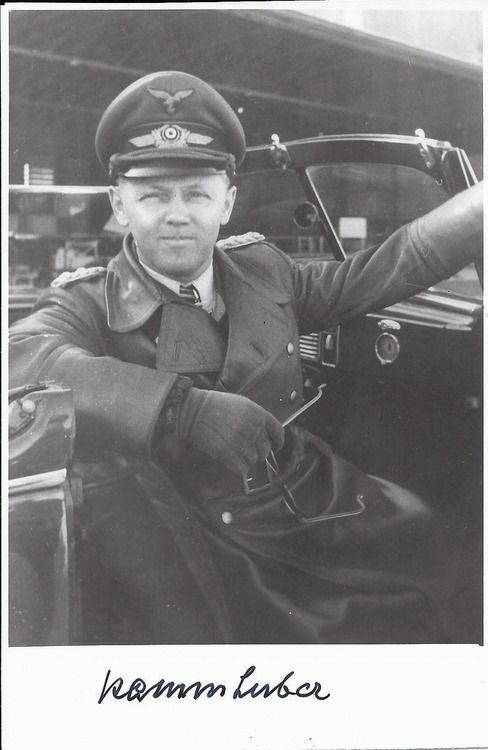 He was a career officer in the Luftwaffe and German Air Force. Kammhuber is best known as the first General of night fighters in the Luftwaffe. He had a fascinating life; among other things, he was shot down during a raid and became a French prisoner of war before being released due to the German victory. After his release, he resumed his high position in the Luftwaffe. It was not the last time that his career would be interrupted and then resumed. Kammhuber was an excellent organizer, strategist and theorist, which is precisely what the top levels of the Luftwaffe needed. While not an ace himself, Kammhuber formed the famous "Kammhuber Line" which was a layered defense using Freyda raday designed to shield Germany from Allied air attacks. While his programme worked for a while, ultimately the balance of forces and the porous nature of the line destroyed the line's effectiveness. 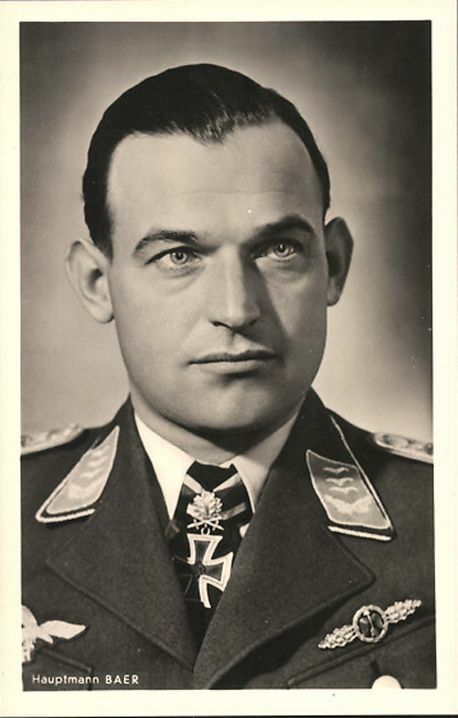 Kammhuber was dismissed after running afoul of General Gerhard Milch (who himself was dismissed afterward) on a minor issue, though reinstated in the Reich's last days. Kammhuber had innovative ideas, such as the Wilde Sau ("wild boar") concept of using day fighters at night by the light of the moon. The German night fighter force was extremely capable and feared, but as the war wound on it was simply overwhelmed. In a backhanded and indirect way, Kammhuber was responsible for the creation of the Allied "bomber stream" that dominated the Allied air campaign; it was formed to overcome his chain of defense. Kammhuber did not commit any crimes and was just an officer doing his job. 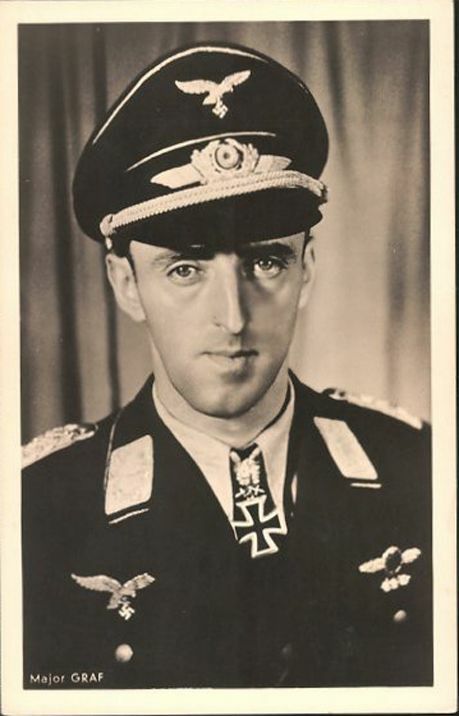 He was one of the rare Luftwaffe officers who was essentially reinstated after the war (after joining General Galland in Argentina for a while) and thereafter rose to great heights in the German Air Force. 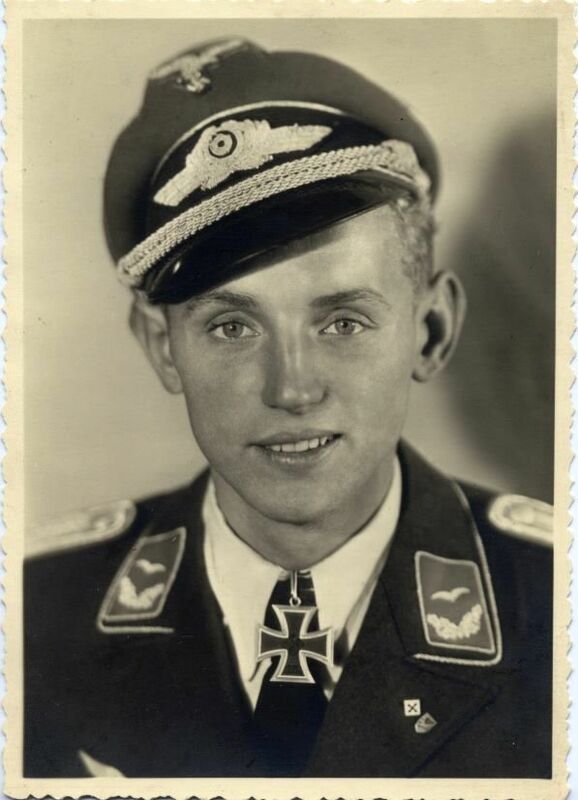 He became Inspekteur der Bundesluftwaffe until 1962. 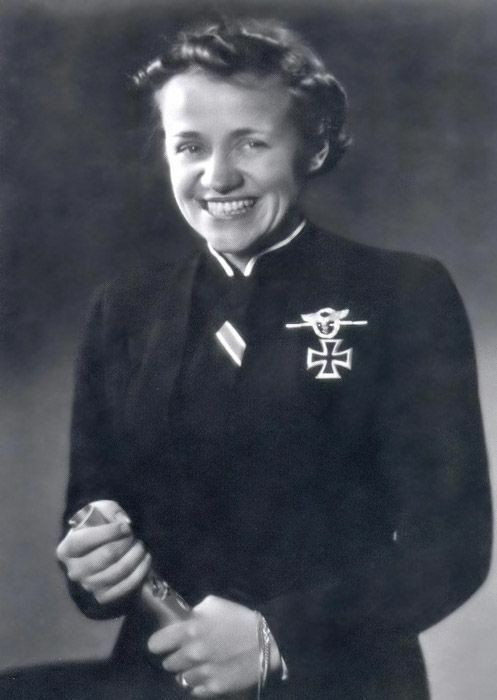 A formal portrait showing Hanna Reitsch (March 29, 1912 - August 24, 1979) wearing the Iron Cross 1st Class and ribbon of the 2nd Class. Probably taken when Hitler awarded her the Iron Cross First Class. The aces did not operate in a vacuum. They required extensive support from people whose jobs were not shooting down planes, but still went far beyond ordinary duties. Hanna Reitsch was the first female test pilot in the world and one of the most famous pilots in history. While not technically an ace, she was a huge asset to the Luftwaffe throughout the conflict and performed many heroic stunts (such as the first demonstration flight of a helicopter) that add to the lore of the Luftwaffe. After surviving a terrible crash while test-flying the Me 163 in 1943, Hanna received the Iron Cross First Class at the hand of Hitler himself. She was from an area (Silesia) that was to become part of Poland, and her entire family (save her) committed murder/suicide on 3 May 1945 rather than be turned over to the Soviets. Hanna's exploits can't really be summarized, she was the heart of the Luftwaffe. 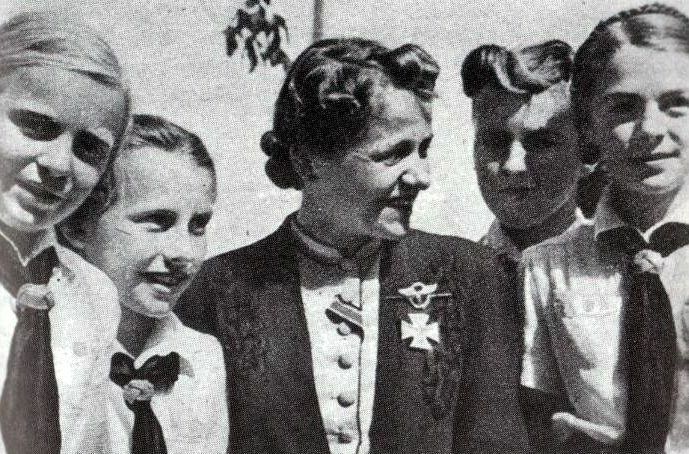 Hanna Reitsch with League of German Girls (BDM) members. And what have we now in Germany? A land of bankers and car-makers. Even our great army has gone soft. Soldiers wear beards and question orders. I am not ashamed to say I believed in National Socialism. I still wear the Iron Cross with diamonds Hitler gave me. But today in all Germany you can't find a single person who voted Adolf Hitler into power ... Many Germans feel guilty about the war. But they don't explain the real guilt we share – that we lost. Below, the end of the Luftwaffe. Dear Mr. Bjorkman, Very well written article. Please see if you can include Hans Jochen Marseille (158 kills) who was the top scoring ace against the western allies. 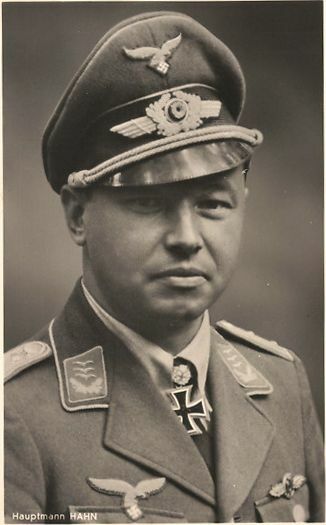 Werner Molders is of particular interest because he introduced the (rotte) or pair system and the finger four as standard formations for CAPs (combat air patrols) in the Spanish Civil War in Spain as part of the Condor Legion. Hermann Graf was the first pilot to achieve 200 kills and Erich Hartmann the first to record 300 kills in military aviation history. Hannes Trautloft needs to be remembered for his humane gesture in saving the 166 airmen POWs held at Buchenwald concentration camp. Please see the link :- https://en.wikipedia.org/wiki/KLB_Club. 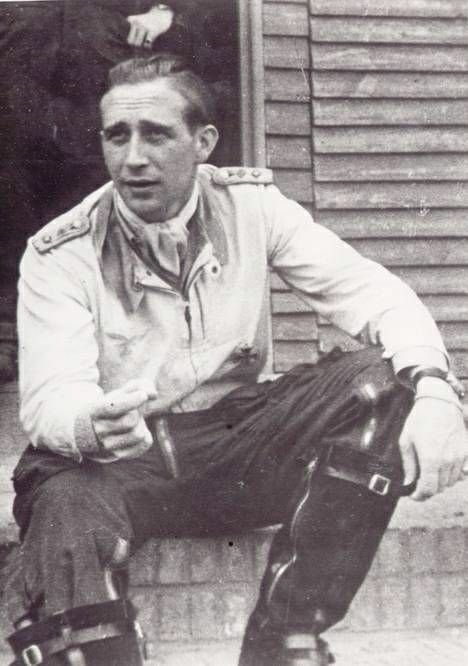 Please also add a separate feature on Franz Stigler and the B - 17 (Ye olde pub piloted by Lieutenant or Captain Brown of the US Army Air Force) spared by him. Thanks, Raja, those are good suggestions. Marseille was a big propaganda hero, his death was a major blow to the war effort beyond his prowess as a pilot. Johannes Trautloft, of course, was the boss at JG 54 (the "Green Hearts"), one of the top fighter squadrons which doesn't have much notoriety in the West because it flew in Russian skies. Very interesting ideas, I appreciate it. Dear Mr. Bjorkman, Please see the incredible and moving real life story of Franz Stigler and Charlie Brown (which took place in the skies over Europe on December 20, 1943) in the link :- https://en.wikipedia.org/wiki/Charlie_Brown_and_Franz_Stigler_incident. An aviation writer, Adam Makos, has written about the incident in his bestseller " A Higher Call ". The ardent fans of your site would love to see this story told pictorially in your unique and inimitable narrative style. I'll give it a look, Raja, I'm not familiar with that story, but I'll see what I can find..
Dear Mr. Bjorkman, Please see the Wikipedia link on the finger four fighter formation, devised by the Finnish Air Force and refined and polished by Werner Molders and Gunther Lutzow of the Luftwaffe in their experience in the Condor Legion in the Spanish Civil War :- https://en.wikipedia.org/wiki/Finger-four. Yes, there were men like Gustav Rodel and Erich Rudorffer in the Luftwaffe, who performed their martial duties in Erwin Rommel's phrase - Krieg Ohne Hass - war without hate.